Following the disastrous terrorist attacks in Paris last Friday, local restaurant and bar owners proclaimed a call to action “Tous au bistrot!” (“Everyone to the bar!”) on Tuesday that saw Parisians flocking to pubs and cafés to oppose the acts of terrorism that wreaked havoc on the City. Five of the six sites targeted by the coordinated attacks that killed at least 129 people were eateries and watering holes? in the city. To push back against this flat-out barrage on French culture , food magazine and restaurant review site Le Fooding took to social media. Using the hashtags ?#TousAuBistrot and #JeSuisEnTerrasse meaning “I am on the terrace” referring to the ubiquitous sidewalk seating throughout the city. 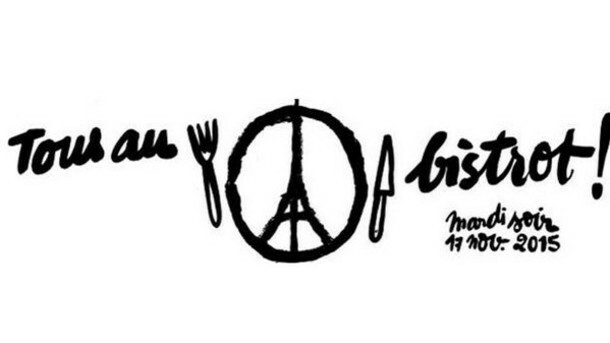 The group organized a peaceful, positive campaign tagged and the event paid homage to victims, supported hospitality professionals who were targeted, and refused to let Parisians be “betrayed by our fears.” Le Fooding also adapted the Eiffel Tower logo designed by Jean Jullien expressing peace, turning it into a plate with fork and knife on either side and text reading “Tuesday night, November 17, 2015 — Everyone to the bar!” ? The movement prompted Parisians to dine and drink together for a uniquely French act of solidarity and reflect during a moment of silence at 9 p.m.? But it was also a harbinger of lifted spirits, ?celebrating café culture and reinvigorating the city’s joie de vivre. “It will be an act of peaceful resistance,” Le Fooding founder Alexandre Cammas? told theNew York Times ?on Tuesday. “It is very important that Paris gets up again, fast, and continues to be Paris. Otherwise, it would mean that we let them win.” ? Nigg*s In Paris: Ice Prince And Manager, Tobi in Paris.